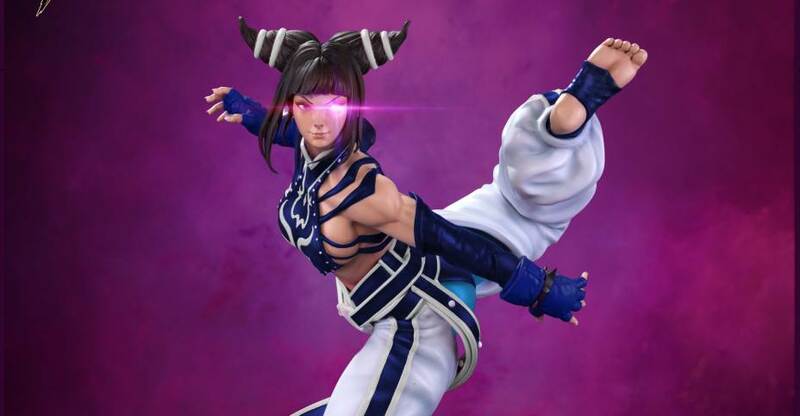 Photos of the finalized Street Fighter Femmes Fatales Juri Han 1/6 Scale Diorama Statue have been released by Kinetiquettes. The statue will be part of a larger diorama display for fans who collect all three statues. 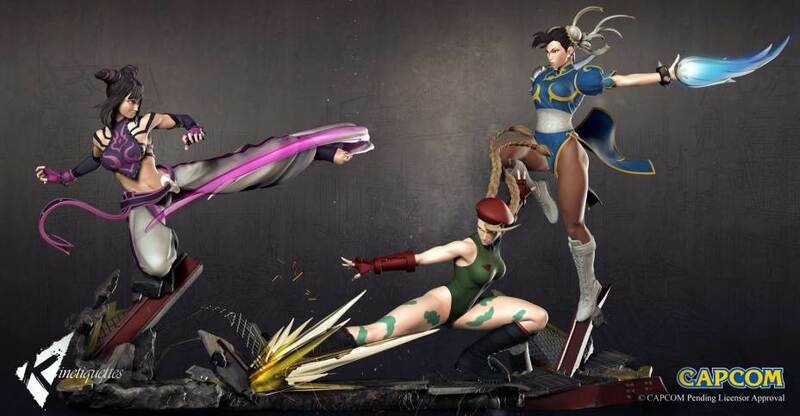 For the full diorama, fans will need to purchase Juri, Cammy and Chun-Li to form the Femme Fatales Street Fighter Display. This is it, the wait is over. Femme Fatales project was revealed some months ago and a lot of people were looking forward for kinetiquettes diorama featuring those iconic female characters from the Street Fighter franchise. The first lady to be featured on the Femme Fatales dynamic diorama will be the holder of the Feng Shui engine. Being a taekwondo fighter, looking for revenge against Shadaloo for the death of her parents, Juri joins S.I.N to obtain the power necessary to accomplish her plans. This piece is made of high Quality polystone, sculpted by Wandah K – Tioxic in 1/6 scale, prototype painted by Hugh Lee, with all the dynamism Kinetiquettes is known for. Pre order will open soon. Stay tuned! Read on for all of the new photos. The upcoming Street Fighter Femmes Fatales Diorama Statue display has been fully revealed by Kinetiquettes. The diorama will be broken into three individual statues: Chun Li, Cammy and Juri Han. Each character features a dynamic pose based on their in-game special moves. The images showcase the final 3D rendered design for the diorama. When finished, these will be 1/6 scale statues with statue bases that connect together for the larger dio seen here. Pre-orders will open in the near future. We’ll update with further details when they emerge. Read on for all of the new images. There are plenty of new photos. Read on to check them out. Pop Culture Shock promises a surprise Juri reveal for next week. A full gallery will also be revealed in next weeks newsletter. You can see more details and a few previews after the jump. In this weeks newsletter, Pop Culture Shock teased their next Street Fighter Statue. 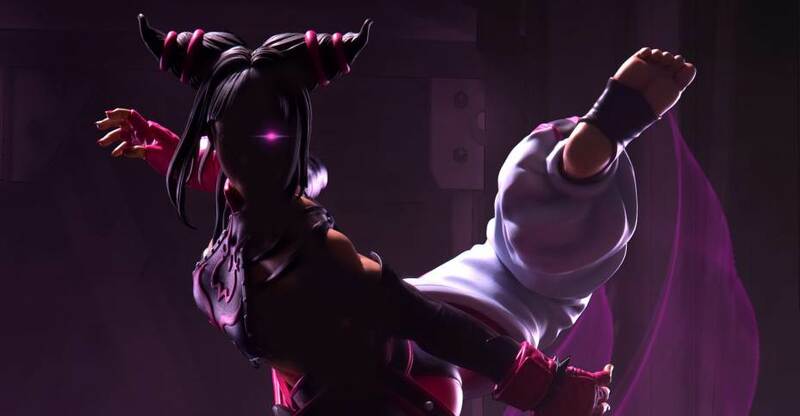 The teaser gives us a shadowy look at a new Juri Han 1/4 Scale Statue. We got our first real look at the statue at New York Comic-Con 2016. We’ll continue to update as more photos and details are releases. Click the banner image for the full teaser. 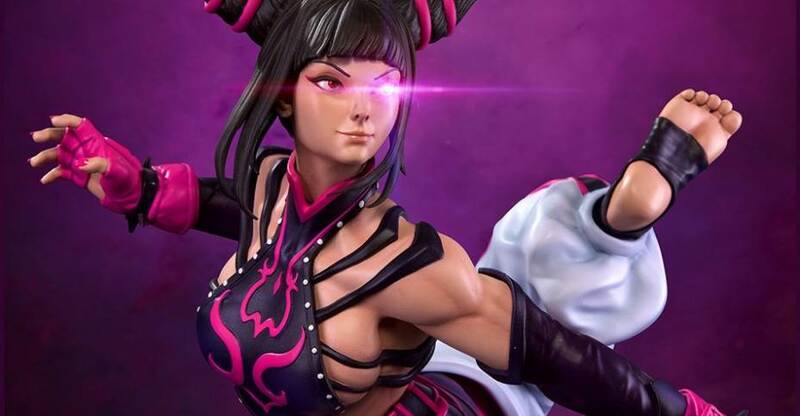 Kinetiquettes has posted a preview for an upcoming Street Fighter Juri Han Femme Fatales Statue. The images showcase the work in progress 3D sculpt being done. 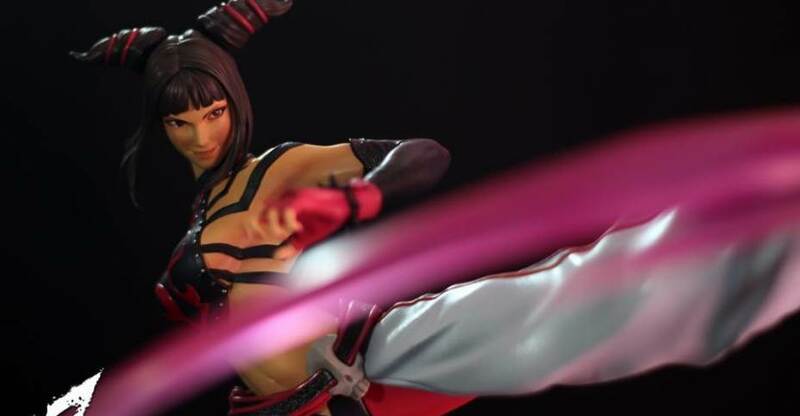 It gives fans a look at Juri‘s dynamic pose being created, as well as a close up of the head sculpt. We will share more images and details when they become available. Read on to see the new previews. Kotobukiya has full revealed their Street Fighter Juri Han Bishoujo Statue. This is our first look at the completed, fully painted, figure. 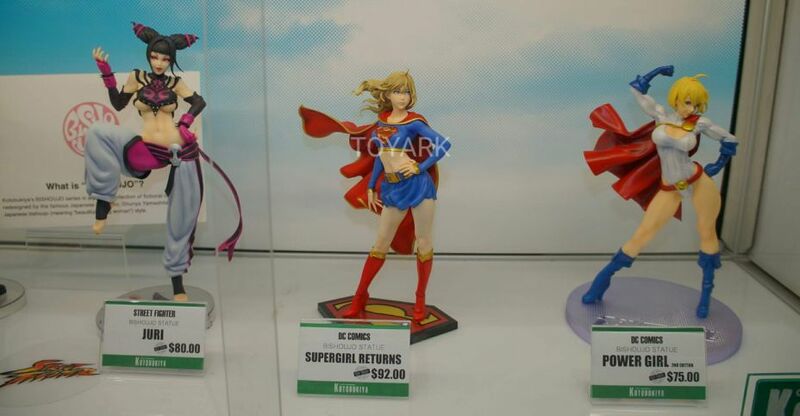 During our coverage of the Kotobukiya booth at SDCC 2014, we only saw an unpainted prototype. Kotobukiya has scheduled the statue for an April 2015 release.